Last weekend, the Jackets visited the Ramsey Center in Athens, Ga., to compete in the Georgia Challenge. Second-year head coach Michelle Collier took full advantage in her first trip to Athens as Tech won it all. The team did not lose a single set, sweeping Mercer, Georgia Southern and UGA. Two days later, Tech came back to the O’Keefe Gym to beat Auburn, 3-1. The weekend started off with a match against the Mercer Bears. The Jackets came out strong, taking an early 14-4 lead and then stretching it to 19-8. After that, the team did not allow another point to win it 25-8. For the set, Tech did not commit a single hitting error, swinging with 14 kills on 22 attempts. The next set was much more competitive. Mercer would not back down as they continued to tie up the score six times throughout the set. Tech was up 24-18 before letting the Bears storm back to a 24-24 tie. Fortunately, the Jackets claimed the next two points to win the second set. In the third set, Teagan Van Gunst highlighted the set with three aces that were part of a six-point rally to stretch the lead to 15-9. Tech went on to win 25-15. The Jackets are now 29-1 all-time against the Bears. The next day, the team played an early 10 a.m. match against the Georgia Southern Eagles. The first set was an intense battle, as the score was tied a total of 13 times throughout the set. The Jackets would eventually come out on top with a 28-26 victory. In the second set, the Jackets lessened their errors and improved upon their swinging percentage to .387 compared to just .220 in the first set. Finally, in the third set, they continued to take care of business, going on to win 25-14. Nine hours later, Tech went on to face host and rival UGA. The first set was another fierce competition. After an 18-18 tie, the Jackets took the lead and never gave it back. They would eventually win the set 25-22. For the third, after an early 3-3 tie, the team grabbed the lead and rode it to a 25-21 win. Tech’s dominating performance carried over into the third set, finishing the night with another 25-21 win. Ashley Askin and Sydney Wilson both had 10 kills each. Van Gunst poured in eight kills, while Lauren Pitz had seven. Tech is now 15-2 in their most recent 17 matches against Georgia. Van Gunst was given the MVP, and Wilson was awarded to the All-Tournament team. To finish off the Labor Day weekend, the Jackets were back at it Sunday afternoon against Auburn inside a packed O’Keefe Gym. The team started off solid, winning their first two sets 25-16 and 25-19. In the third set, they could not seem to find a rhythm and fell to an early 2-8 deficit. The Tigers remained sturdy and held the lead to win the set 25-19. “In the fourth game, we got the starting lineup where we wanted it for the set, and we were able to execute,” Collier said, courtesy of ramblinwreck.com. 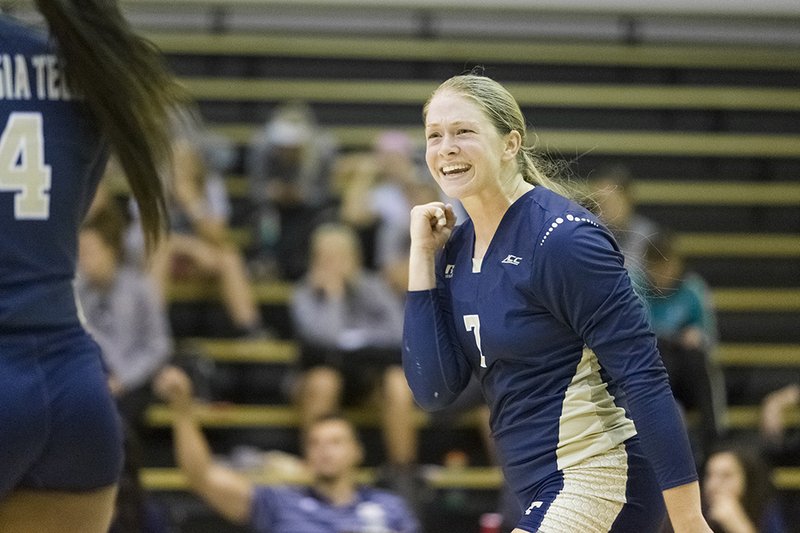 It was a close contest, but the Jackets pulled out the set and match win with a 25-21 victory. After the undefeated weekend, Tech will head over to Lincoln, Nebr., for the Nebraska Ameritas Players Challenge on September 11–12. They will go up against USF, UC Davis and Nebraska.